If a live grass substitute doesn’t need to be watered or mowed, what does it need? To last a long time and look great, a faux lawn needs the right installation with the right materials, and a little help from some great tools along the way. Watersavers has all the best turf accessories for synthetic grass installation and care (e.g., gopher wire and turf padding). We select and offer the industry’s best turf tools like our EasySeam Machine. We even carry golf accessories and a spray that smells like real fresh cut grass! All of these items can help you get the most from your lawn when you install, and for years to come. Please take a look at our online gallery to see what other turf related items we carry. These artificial turf accessories can mean the difference between a water less lawn that stays clear and smooth for decades, and one that suffers rough damage from vermin or weeds. When you’re laying your grass onto dirt, protect your investment with a layer of gopher wire. This will keep gopher tunnels from causing bumps and lumps. Small plants can also try to push up through your faux grass, causing damage. Place a layer of weed barrier fabric below the gopher wire. 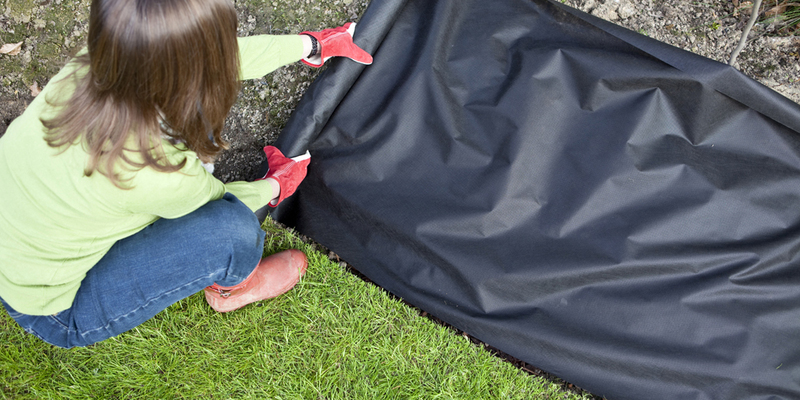 This dense textile shields your lawn from unwelcome pop-ups. Without barrier fabric,an aggressive weed can push a bump or a hole into your beautiful green from below.On a rocky surface, gophers can’t burrow but weeds still can, so we recommend protection under your grass on all terrains. When aggressive unwanted plants try to grow up through your yard, make sure they will hit a weed barrier fabric that will stop them in their tracks. To make it easy,Watersavers offers a variety of sizes of landscaping fabric and gopher wire.Get the right barrier for the ground you’re working on, so your yard looks it best. In the life of your real grass substitute, the most important moment is installation. How you set your faux grass in place determines its future in two key ways. The kind of turf padding you put underneath affects how long your new landscape lasts, and how comfortable it is to walk, run, and jump on. How you bind the actual pieces of lawn together affects how smooth the look is, now and in the future. Above your protective barrier and below your grass, you need the right padding. Our polyfoam pads are available in three weights to match the level of foot traffic for your new landscaped area. For high impact areas like playgrounds, you need heavy-duty pads that are designed to absorb shock, and will protect against injury on impact. That’s why we offer our custom cut 8mm thick Shock Pads. Not all areas need such a heavy-duty solution, but every faux lawn needs padding. We have a range of pads available at different weights, for different uses. Once you’ve placed your protective barrier and your padding, it’s time to place your grass on top and bind the strips of lawn together. We recommend the Easy Seam Machine, which binds pieces together in just a few seconds so you can lay your green quickly. We offer it to buy or rent. At the push of a button, this handheld electric tool uses a pre-programmed heating cycle to activate adhesive tape without the mess of glue. The turf never becomes hot to the touch. That means there’s no risk of damaging your new lawn with direct heat or glue. The end result is an even and sturdy seam, with a low-profile appearance that blends right into the grass. Without the right padding, your lawn may look great but it won’t wear well. Without the right binding, your lawn may last, but won’t have top notch visual appeal. It’s all using the best accessories and the best tools to create the perfect green. Choosing what’s below your grass, what’s holding it fast, what turns it from a lawn into a sporting zone, or what keeps it clean and fresh for decades to come, Watersavers offers turf tools and accessories to get the best look from your grass. Visit any of our store locations or our website, to browse our full selection of accessories.